We are a full service landscaping company serving the Greenville area. Our company was started roughly ten years ago by Todd Cochran, who has over 20 years of experience in the landscaping industry, as well as a degree from Clemson University in Horticulture. Whether we are designing your Greenville landscape, or maintaining your business’s property, our service starts with communication. Communication is the basis for a great design, and quality service. 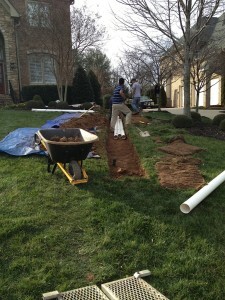 Give us a call today and we can discuss our processes for landscaping Greenville properties. We aim to set ourselves apart from other landscaping companies in Greenville in a few different ways. We really focus on communicating clearly with our clients to create a great landscape design. Our experience and education helps us create unique designs that fit your needs, whether that be budgetary, spacial, or otherwise. And the third way that we distinguish ourselves is with our follow through. From initial design, to final completion we are there for you. Once your project is done we create a schedule for you to help you maintain and care for your new landscape. There is no question, a water feature on your property makes a statement. Over the years, as we’ve been landscaping Greenville properties, we’ve installed a variety of water features. A small water feature in a back yard can bring a relaxing effect. A larger water feature for your business can say to customers “Look, we’re a successful business, we have a luxurious water feature. You can trust us, clearly a lot of other people have.” Call us, we can talk to you about a variety of water features and design options. If you are looking to incorporate a bit of nature into your landscape, a waterfall or pond is the best way to do that. Depending on your current landscape, your budget, and the materials that could work for your property we’ll come up with a custom design that can give your Greenville area landscape a relaxing feel, with a touch of nature. Safety: Landscape lighting can help illuminate paths, walkways, driveways or other areas that you might use often, but that might be difficult to navigate when it gets dark. Beauty: Mood lighting? It’s not just for swanky bar lounges. Outdoor lighting can evoke emotions and set the mood for your Greenville area home or business landscape. Whether you want a soft, relaxing mood or an upbeat, energizing atmosphere we can help you design and install outdoor lighting. Security: Illuminate dark corners of your property to dissuade trespassers. Don’t want bright floodlights all over your property? We can strategically place low voltage lights to create a level of visibility that will make trespassers feel uncomfortable. Usability: Don’t let your beautiful patio, or deck go to waste. Stay up late into the night on your beautiful, well lit landscape.